"Before you can design something, you need to think about its intended purposes and how it can be used if things change. We need to create designs that adapt to a faster, more agile and efficient lifestyle. This goes back to good research and trends and defining which are temporary and which will last." PLP Senior Associate Partner, Tina Qiu, was interviewed by Insider Trends magazine on the future of retail design. How can trends in design be reconciled with longevity and adaptability of space? Can constrictions in the brief instigate creative responses? And is their a vision for the future that helps guide our designs? Tina, architect and designer for the shell and core the new Adidas flagship store on Oxford Street, which will open later in the year, answers these questions and others. In a joint venture with Newcastle University, we are pleased to announce the first year of student applications for the Gavin Eldred and PLP Architecture Bursary. Gavin Eldred, 1965 - 2017, earned his degree in Architecture at Newcastle University. Passionate about architecture, Gavin worked to support his studies. He travelled to New Zealand to practice, and after settling in London became a Director at PLP Architecture. Among the significant built work that Gavin helped deliver are The Four Seasons Hotel in Abu Dhabi; NOVA-Victoria in Westminster; and 22 Bishopsgate, the tallest office tower in the City of London. In honour of Gavin’s love for life and Architecture, PLP Architecture will offer a bursary in the amount of £2500 to one student, to encourage the study of Architecture. The bursary will be awarded in four consecutive years to four different students. Karl Sharro, PLP Partner, presented research on Gulf urbanism in a keynote speech at Dubai Design Week. The discussion illustrated our ideas about the future development of cities in the region, and how technological development can have a bold influence on interaction, movement, culture, learning, the workplace and living. Arab cities today face serious challenges, but they also have huge potential. We have been working on a piece of research, leading to the first in a series of publications, The New Arab City - Volume 1: The Gulf. The debate has been reported by The National, who demonstrated glee in reporting some of the more futuristic elements of the proposals. PLP Partner and President, Lee Polisano was interviewed by Elizabeth Hopkirk for Building Magazine. The cover story delves into Lee’s history, motivations, hobbies, and aspirations for the future, as well as discussing TwentyTwo Bishopsgate, currently under construction and the tallest structure in the emerging cluster of towers in the City of London. The Telegraph reports today on the unique interiors of our new residential development for Lodha in Bloomsbury. The building will open at the end of the year, and will offer 230 apartments with amenities for residents, and a landscaped courtyard with communal gardens. The interior design team comprises Bowler James Brindley, and the Spanish designer, Patricia Urquiola – it is her debut residential project in London. PLP Founding Partner Ron Bakker delivered a keynote speech at the Kohler Design Forum at the Jerwood Hall, LSO St Luke’s in London yesterday. The theme of the conference, “All Things Connected”, provided a good basis for interesting discussion in relation to the integration of architecture, design and technology. Hosted in conjunction with Monocle, a global affairs and lifestyle magazine, the new series was moderated by Josh Fehnert, Executive Editor at Monocle. Conversations were focused on how smart technology is shaping the world we live in and offered an interactive discussion on the integration of design and technology into our daily lives, touching on meaningful topics such as ‘Responsive Cities’ and discussing the use of smart technology in a people-centric way, and where the possibilities of artificial intelligence might take us. Corso Como Place in Milan, designed by PLP Architecture, was presented today to an audience in Milan at a well anticipated and attended launch event. 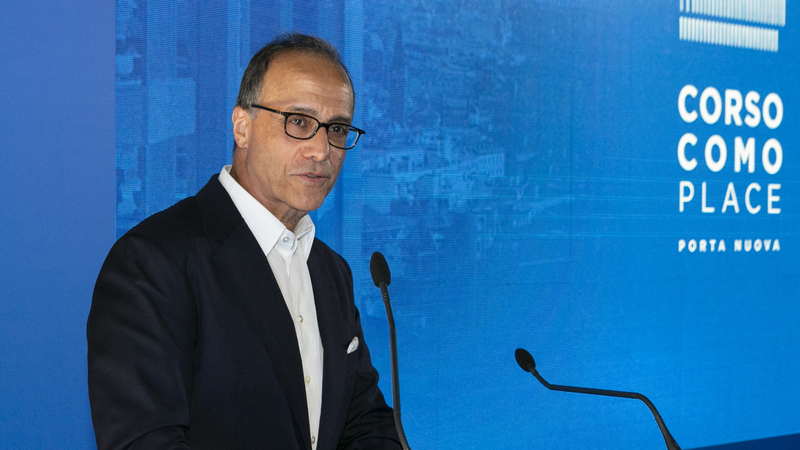 Manfredi Catella, Founder and CEO of COIMA SGR, client for the project, explained the motivations for the scheme in the wider context of the Porta Nuova masterplan, which aims to connect a new series of developments with high quality public and community spaces. Lee Polisano of PLP explained our design approach for Corso Como Place, which comprises the redevelopment of an existing modernist building: The Unilever Tower; which was constructed in 1962 but has become unloved and unused due to some misplaced attempts to renovate the building in the past. Our approach re-uses the existing structure of the original building to create a reimagined crystalline urban object in an enhanced public realm. Alongside, a new pavilion building acts as a gateway to the lively hub of the adjacent Corso Como. The development is currently under construction and is due for completion at the end of 2020. Karl delivers a regular feed of satirical musings on middle-east politics and culture to his 135,000 followers on a daily basis @KarlreMarks. His posts have recently been collected and published in And Then God Created The Middle East and said ‘Let There Be Breaking News’. The National, Abu-Dhabi’s leading English language newspaper, reported on his life and career in an article published today. The summer exhibition at the RA is always a favourite event in the London cultural calendar. This year, PLP Architecture was fortunate enough to have two project models selected for the architecture room: Oakwood Tower, and Tour888/SkyPod. Both projects are the result of our own research, conducted by PLPLabs. Oakwood Tower is the first in a series of collaborations with Cambridge University to interrogate the potential of tall buildings constructed from wood. The SkyPod project is an exploration of a new system of circulation that takes elevators out of central cores and positions them on the exterior of buildings. We are interested in how this logistical move might influence the future form of new urban structures. Curated by Piers Gough, the newly configured architecture room at the RA forms a key and connected centrepiece for the entire exhibition. It offers a refreshed visual approach that balances pieces from both established and emerging practices. A central spine of tall buildings, which includes PLP’s two entries, divides the room into two main sections and playfully features a fun, accessible portal in its middle through which visitors can pass. In addition, the physical bounds of the space have been blurred thanks to intentional placement of more architectural pieces of art in the adjacent rooms. At PLP, we have a large and dedicated team of modelmakers led by Neil Merryweather. We advocate the role of the model in the design process by bringing together craftsmanship with artistic vision, intelligence of approach and a continued exploration of new materials and techniques. Our modelmaking team uses processes including etching, lazer cutting, 3D printing and rapid prototyping to create an extraordinary array of representational models. Lars Hesselgren, Head of Research at PLP Architecture, revealed the latest design for SkyPod, featuring an innovative propulsion system based on Maglev technology to delegates at the 22nd International Congress on Vertical Transportation Technologies. SkyPod is the result of four years of research undertaken by PLP Labs, the in-house think tank of PLP Architecture in London. For this research project, we have proposed the replacement of the traditional vertical elevator shaft with a multi-directional transport system on the exterior of the building. Liberating vertical transport from the central core to the exterior of the building opens up opportunities for unprecedented architectural forms. If current skyscrapers often feel monolithic, self-contained and sometimes indifferent to their context, SkyPod will allow for new types of buildings that, despite their height, are holistically integrated with the grain of the city around them. The elevator has been a primary influence on the shape and appearance of the modern city to date. We believe that its inevitable demise will be the catalyst for the next chapter in the formal life of the city. SkyPod has been developed by PLP Labs, our in-house think tank co-opting ideas from outside of architecture’s standard discourse into the day to day life of the studio. PLP Architecture has been named by the London Stock Exchange Group as one of the companies that are making Britain tick. PLP was the first featured company in the Creative Industries sector and the only architectural practice to be singled out for this prestigious publication. PLP’s design and research work continues to investigate the sometimes unexpected impact of technology on our architecture, cities and our way of life. The Edge, our new headquarters office for Deloitte in Amsterdam, has been named by Bloomberg as the greenest and the smartest building in the world. Our headquarters for Sky in London creates a radically new environment where wellbeing acts as an engine for creativity; the building has been recognized through numerous awards including the British Council for Offices Best of Best 2017. The Collective Old Oak in London is the largest co-living space in the world, offering an unprecedented residential typology for young professionals in a housing market that has been struggling to meet their needs. PLP Labs, our in house think tank, co-opts ideas outside of architecture’s standard discourse into the day to day life of the studio. Part of this effort is our collaboration with Cambridge University to develop London’s first all-timber residential highrise. This 300 meter tower employs a structural system poised to radically alter construction methods in the upcoming years as well as fundamentally transform our relationship with nature in the city. We are also researching the critical role of mobility in the contemporary metropolis through the development of an integrated form of movement through the city and its buildings. One of our current projects is SkyPod – a new vertical transportation concept which will revolutionise skyscraper design. Another is CarTube, an urban transport system based on a fusion of two technologies - mass transit and autonomous vehicle – that will radically reinvent urban mobility and change the nature of public realm in the city. We are very pleased that others are taking notice of our work, and we look forward to sharing some of the exciting projects that are still on our drawing boards. PLP Partner Andrei Martin spoke at Texas A&M College of Architecture. The lecture, titled “Another Kind,” focused on lesser known PLP projects, including N+ Masterplan, Yuyao International City of Culture and Arts, St Helen's and The Nexus. Porta Nuova, Milan’s central business district, was awarded Best Urban Regeneration Project of the year at the MIPIM ceremony gala in Cannes on Thursday. The vision of COIMA CEO Manfredi Catella, and the result of a vast collaborative effort - involving more than 20 design architects from 8 different countries including PLP president Lee Polisano and PLP partners Alessandra Luzzatto and Andrei Martin, the project has transformed over 290,000sqm of industrial wasteland into a thriving mixed-use urban hub. Comprising office space, residential units as well as retail and cultural venues, Porta Nuova is one of the largest urban development projects in Europe. PLP Partner Kevin Flanagan spoke at this year’s Smart Building Conference in Amsterdam on the subject of ‘Meeting Places and the APIs of the Working Community’. Introducing our project The Edge for Deloitte, the presentation focussed on how architecture responds to big changes at the interface of people, technology and the built environment and the different ways this can improve our way of life. Oakwood Timber Towers I & II feature in the new exhibition ‘Timber Rising – Vertical Visions for the Cities of Tomorrow’ at Roca Gallery. Curated by Studio Woode and Clare Farrow, the comprehensive show is the first of its kind in the UK that introduces the phenomenon of timber structures, sustainability and their ambitious concepts. Free to visit and open until 19th May 2018. Oakwood Timber Tower London features in The Economist Films about visionary wooden buildings and the increasing use of timber as an innovative solution to problems posed by urbanisation. Michael Ramage from the Centre for Natural Material Innovation at the University of Cambridge, highlights the concept of our collaborative project in the video below. PLP Architecture has launched a studio in Japan. The office is PLP’s second expansion in Asia and will operate alongside existing bases in London and Beijing. Located in the Shibuya area of Tokyo, the studio will serve local clients, support projects in the region and act as a liaison for international clients pursuing opportunities in Japan and Southeast Asia. PLP Architecture is an award-winning practice that has created some of the world's smartest and most sustainable buildings that redefine what it means to live and work in today’s cities. Completed projects include The Edge in Amsterdam, which Bloomberg called ‘the smartest building in the world’, and Sky Central in London, which the British Council for Offices (BCO) designated the best workplace for 2017. Working closely with London-based PLP Director Midori Ainoura, the Tokyo office will be led by Raita Nakajima. Raita has a wealth of experience in delivering high profile international projects in the UK, Europe, Middle East, Japan and SE Asia and has worked with the partners of PLP for more than 10 years. The opening was featured in World Architecture Community. The Collective Old Oak features as part of the recently opened exhibition ‘New Urban Body’ at La Triennale di Milano, curated by Giordana Ferri of Fondazione Housing Sociale and designed by ETT SpA Solutions. The playfully designed and interactive show illustrates the flexibility and growth of how people live and work together and what kind of positive impact this has on urban redevelopment and the transformation of the city. We're thrilled to announce that Sky Central has won Best Workplace of the Year at the Architects’ Journal Awards and UK Project of the year at the FX Design awards, alongside AL_A and Hassell. It is with enormous regret and great sadness that we inform you of the unexpected passing of our colleague, our mentor, and most of all, our great friend Gavin Eldred. Many of us were fortunate to know and work with Gavin for many years. His breadth of knowledge, deep commitment to the craft of our discipline and his ability to bring buildings to life have enriched some of our most important and pivotal projects. Gavin possessed unique abilities that enabled him to assemble, orchestrate and inspire teams throughout all stages of design, galvanising them to accomplish more than they ever thought possible. Through his generous and patient mentoring, he trained an entire generation of younger architects, who, in turn, admired Gavin as the exemplar of what an architect should be. Gavin’s legacy will endure in the ambitious and innovative buildings he helped create. Sky Central wins 'Best of the Best' and 'Corporate Workplace' categories at this year's British Council for Offices National Awards. Our high rise in Stratford, the second building we have designed for the co-living startup Collective, was approved last night by the London Legacy Development Corporation. The building, a speculation on the future of housing and urbanism, proposes a vertical ecosystem of working, playing, creating and living. Located near London’s Olympic Park, the 19-storey building will accommodate 250 co-living units along with a wealth of indoor and outdoor amenity spaces. At ground, a gallery curated by the Bow Arts Trust will link the street to the Channelsea River beyond. Above, an office incubator for local start-ups will provide co-working spaces for over 80 people. The expression of the project is not conferred through a flamboyant shape or through an overwrought facade, but rather by its collective event spaces, which give the building its identity. The project has a simple, calm and dignified facade and a streamlined, slender silhouette. Against this calm composition, the rooftop amenity spaces stand out as an extraordinary counterpoint; an expressive beacon in the sky. PLP was in responsible for the Interior architecture of the new Sky Central Headquarters. Working together with workplace designer HASSELL, we conceived a design that promotes flexible, collaborative, task-based working. This flexibility was achieved through the creation across the vast floor plates, of multiple distinct neighbourhoods, linked together by the architecture of central mezzanines, stairs and ramps. This connective tissue encourages employees to take different routes around the office, allowing for unexpected and surprising interactions to occur naturally and act as a catalyst to internal business innovations. Lee Polisano, president and founding partner of PLP Architecture joined property entrepreneur David Rosen, Hon FRIBA and senior partner at Pilcher Hershman, to discuss how their projects have impacted London and to give their insights on the ever changing property and architectural landscape in London. Paul Finch, World Architecture Festival Director, moderated the event. The Francis Crick Institute is the result of an unprecedented partnership between six of the world’s leading biomedical and academic organisations, bringing together multidisciplinary groups of researchers to develop ground-breaking research for the improvement of human health. PLP, working together with HOK, have designed the building to be highly interactive and open, with five floors of laboratories above ground specifically designed to promote interdisciplinary work. The Francis Crick Institute adheres to strong sustainability principles, setting a new standard for modern sustainable design. The building has achieved an Excellent BREEAM rating with a final score of 74% and has been designed to comply with Building Regulations Part L 2010. PLP’s Sky Central for major UK broadcaster Sky, has been featured in the Financial Times. The article ‘Sky’s the limit for latest theory in office design’ speaks about the new headquarter building and how the design changes the way staff collaborate and work. In 2013, following an invited competition, PLP Architecture, Arup, Mace, AL_A & Hassell were commissioned to design the new Headquarters for broadcaster Sky, called Sky Central - the main building of their West London campus. The design brief required a building that would galvanise 3,500 employees into a single community whose identity would reflect the fast-paced and ever-evolving nature of broadcasting and telecommunications. Sky Central is a unique example of unconventional (workspace) design, efficient engineering and delivery combined to meet high aspirations around sustainability, flexibility and people wellbeing. PLP Architecture was commissioned by Sky to design the interior architecture and develop the exterior for Sky Central - the main building of their 7,000 - person West London campus. The building is designed to to engage 3500 Sky colleagues in producing the best work of their career. A design was conceived that promotes flexible, collaborative, task-based working. This flexibility was achieved through the creation across the vast floor plates, of multiple distinct neighbourhoods, linked together by the architecture of central mezzanines, stairs and ramps. This established a range of different work areas. This connective tissue encourages employees to take different routes around the office, allowing for unexpected and surprising interactions to occur naturally and act as a catalyst to internal business innovations. These various journeys also shape the central experience of the building: an open space where both ideas and people flow and interweave continually. Cindy Lau, Director at PLP, joined the Mix Interiors Roundtable discussion on ‘Designing an experience’ on April 19th, 2017. Much talked about is the term productivity in the workplace; but many believe that even the end user client doesn’t know what productivity looks like. What seems to be more relevant is focusing on the ‘experience’ and through that the client get the best out from their talents. Cindy discussed the process of engaging the client to understand their aspirations and realise it through intelligent design. She also shared her views on the future of workplace and the importance of designing an experience in relation to productivity. As an example, she introduced PLP’s design of the Edge, which has been recognized internationally as ‘the smartest and most sustainable office building in the world’, and the new headquarters of leading broadcasting company Sky in West London, offering an interactive production hub to 3,700 creatives. PLP's Sky Central building, the new headquarters of leading broadcasting company Sky in West London, hosted the pre-fight news conference for this weekend’s heavyweight fight between Wladimir Klitschko and Anthony Joshua. Journalists and employees watched the two Olympic champions engage in verbal combat during the press conference, beneath the new glass-walled Sky News Studio. "It promises to be an amazing day here in Osterley and it's a great opportunity for the outside world to see our new campus," said a Sky spokesman. The London Planning Awards is organised in partnership with the Mayor of London, London First, RTPI, Planning Officers Society and London Councils, to recognise and reward best practice in planning in the capital. PLP Architecture joined CBRE and HOK as a key party to the Planning Performance Agreement agreed with Camden Council which enabled intensive consultation with key development and design officers from Camden and the GLA. This highly contextual building, that responds to its location next to St Pancras station and the British Library, and the external expression and massing of the building are the result of intensive consultation with the local planning authority in Camden, the GLA, stakeholders and local residents’ groups. 99 events were held in the months prior to the applications submission and this degree of consultation and the low volume of subsequent representations as a result have been highlighted as an example of best practice. The Francis Crick Institute is an extraordinary example of collaborative work in science today. A consortium of six of the UK's largest organisations for biomedical research, the Institute brings together multidisciplinary groups of researchers to develop ground-breaking research for the improvement of human health. To house this centre, HOK with PLP Architecture devised a building that operates both as a complex laboratory as well as a place for collaboration and exchange. Lars Hesselgren, Director of Research at PLP, featured in Emerging Models of Transdisciplinarity, a film about the nature of design research today. A paradigm shift is happening in design that is not rooted in particular disciplines, sectors or industries. Design is becoming an engine of innovation and is disrupting existing modes of production and consumption. Design industry, research and education require a new way of thinking: one that embraces a culture of innovation. Lee Polisano will speak about 'Pioneering Urbanity in an Expanding Capital' at the New London Vernacular Conference on April 26th. This event, initiated by UCL, will explore further with other planners, architects and practitioners some of the issues which are arising in their research project on "Governing the Future City". The Francis Crick Institute, designed by HOK with PLP Architecture, has been shortlisted in the UK National Royal Town Planning Institute’s Awards for Planning Excellence under the category ‘Economically Successful Places’. PLP Architecture has led the planning submission for The Francis Crick Institute, Europe’s largest biomedical research institute, housing more than a thousand scientists from different disciplines next to King’s Cross Station. The RTPI Awards celebrate exceptional examples of planning and the contribution planners make to society. Ron Bakker joined the Annual ULI Winter Drinks, where he spoke about the Future of the Workplace and shared his latest thoughts on office design and working methods and their effect on productivity. Main question was; Is the era of open plan offices coming to an end and will it bring with it another headache for landlords? Ron Bakker was in charge of the design of The Edge, the most sustainable and smartest office building in the world, according to Bloomberg. Other speakers included; Philip Ross, CEO, Unwork, Andrew Lynch, Co-Founder & COO, Huckletree and Kaela Fenn-Smith, Head of Commercial, London Portfolio, Land Securities. The event was organised by the ULI UK Young Leaders Committee at the recently redeveloped Television Centre, in White City, on the evening of 26th January. Hala El Akl, senior assiociate at PLP, co-shares the YL group at ULI UK. PLP’s Oakwood Timber Tower’s Research, developed in partnership with the Centre for Natural and Material Innovations at the University of Cambridge, and engineering firm Smith and Wallwork, looks towards creating new design potentials with tall timber buildings, rather than simply copying the forms of steel and concrete construction. Kevin Flanagan, interviewed by BBC World News, spoke about the human perception and positive impact of wood on our emotional experiences in build environments. Through a combination of theoretical design and physical testing, this research demonstrates the viability of timber buildings at much greater heights than has previously been possible. Tall Timber Skyscrapers are revolutionary, sustainable and are changing the conventional way of building. The project aspires to make tall timber buildings a reality. PLP Architecture has unveiled the concept design for CarTube, during the ‘Future of Urban Mass Transportation’ Conference held on December 2nd 2016 in London. The Conference brought together researchers and scientists from the UK and abroad to discuss the direction of future transportation technology. The CarTube concept translates a pioneering mobility solution which combines two existing modes of transport, automated electric cars and mass transit, into a single, seamless underground road system. PLP Architecture will continue their research on CarTube and will act as a catalyst for innovation, bringing together great minds from different backgrounds to imagine a future where cars don't compete but collaborate. Sky’s new flagship building ‘Sky Central’ has opened at the company’s campus in Osterley, West London. The new office was completed in July, and accommodates 3,500 employees. Designed for flexibility, openness and to foster the lively flow of people and ideas around the business, the building is the centrepiece of Sky’s group headquarters. PLP Architecture was invited to re-think and design the building’s interior, develop the external envelope to respond to the changing interior programme and deliver the project through to completion following an invited design competition via the main contractor bid. Launched in March 2016, Studiomakers aims to provide entrepreneurial solutions to retain existing and create new affordable artist workspaces in London. The initiative is led by Outset Contemporary Art Fund in association with its founding partners The Mayor of London, Second Home, Create London, PLP Architecture and Bolton & Quinn. PLP Architecture, together with Cambridge University and Smith and Wallwork, won the Royal Institute for British Architects President's Award for Design & Technical Research and will go forward for consideration for the President’s Medal for Research. The RIBA annual President’s awards celebrate the best research in the fields of architecture and the built environment. This year, a record-breaking 75 submissions were received from 14 countries. Our research project, entitled Supertall Timber: Design Research for the Next Generation of Natural Structure, was developed together with The University of Cambridge’s Centre for Natural Innovation and the engineering firm Smith and Wallwork. The project aspires to make tall timber buildings a reality. Through a combination of feasibility study involving design for a real world site in the Barbican London and involving manufacturers and physical lab testing, this research demonstrates the viability of timber buildings to modern urban centres. ULI honours outstanding development projects with the ULI Global Awards for Excellence program, which today is widely recognized as the development community’s most prestigious awards program. Winning projects represent the highest standards of achievement in the development industry. The AAP American Architecture Prize honors exceptional designs in 41 categories across three disciplines: architectural design, interior design, and landscape architecture. The winners were selected by a panel of esteemed experts including Troy C. Therrien, Curator of Architecture and Digital Initiatives at the Guggenheim Foundation and Museum; Peggy Deamer, Professor of Architecture at Yale University; Ben Van Berkel, Principal of UNStudio and Professor at Harvard University Graduate School of Design; Alan Ricks and Michael Murphy, Founders of Mass Design Group; and many more. PLP architecture has been invited to a competition to renovate the tour Montparnasse in Paris, France. The co-owners, EITMM, selected, from over 700 interested candidates, PLP Architecture who will now compete with six other selected architects to reinvent the famous Parisian landmark. PLP’s team will be led by founding partner Karen Cook, the designer on Twentytwo, the tallest building in the City of London and Tour First, the tallest building in France. Karen is steering the next stage of the design competition to transform the Tour Montparnasse into a sustainable and innovative workplace. The Francis Crick Institute is an extraordinary example of collaborative work in science today. A consortium of six of the UK's largest organisations for biomedical research, the Institute brings together multidisciplinary groups of researchers to develop ground-breaking research for the improvement of human health. To house this centre, we devised a building that operates both as a complex laboratory as well as a place for collaboration and exchange. Working together with HOK, we have designed the building to be highly interactive and open, with five floors of laboratories above ground specifically designed to promote interdisciplinary work. The RIBA annual awards celebrate the best research in the fields of architecture and the built environment. This year, a record-breaking 75 submissions were received from 14 countries. The research project, entitled Supertall Timber: Design Research for the Next Generation of Natural Structure, was developed together The University of Cambridge’s architecture school, along with engineering firm Smith and Wallwork. The project aspires to make tall timber buildings a reality. Through a combination of theoretical design and physical testing, this research demonstrates the viability of timber buildings at much greater heights than has previously been possible. London’s housing shortage and lack of affordable yet comfortable accommodation, has led to a new trend: co – living, the future way of living for mobile millennials. PLP Architecture has designed ‘The Collective Old Oak’, the world’s largest co-living space.